The original auto-train run by the auto-train corporation was a popular way for families to get themselves and their autos from Lorton VA to Sanford FL for a Disneyworld vacation. The bankruptcy of the original auto-train in 1981 was due to costs from several accidents and an unprofitable expansion to Louisville KY, not because the Virginia trains themselves were unprofitable. 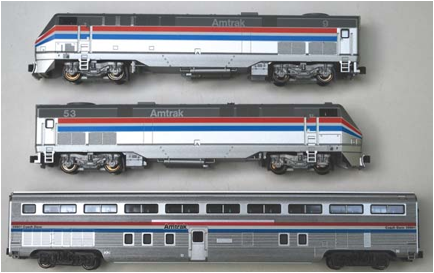 Amtrak took over the service in 1983 initially using passenger and auto carrier cars from the original auto-train supplemented with other heritage cars, and later using the newly purchased superliner passenger cars. Today it is one of Amtrak’s most popular trains and is the highest grossing of any of its trains. It is a long train, often exceeding ¾ mile with about 38 cars or more. The train is too long to make intermediate passenger stops, which are not really needed anyway. The terminals in Virginia and Florida are built to load the cars in groups before assembly into a train, and loading ramps efficiently load autos from end doors. 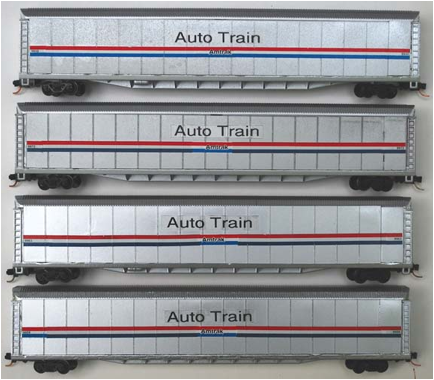 Amtrak acquired auto-train corporation’s 75’ 2-level auto racks, plus the 89’ 3-level auto racks auto-train bought in 1976. These 89’ cars are similar to modern cars the railroads use to transport new cars, but with smoother and more regular side panels. 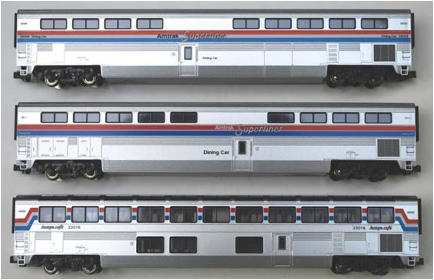 In 2006, Amtrak began phasing out the 75’ 2- and 89’ 3-level auto racks and replacing them with newer 89’ 2-level auto racks that are better able to accommodate modern SUVs and family vans. 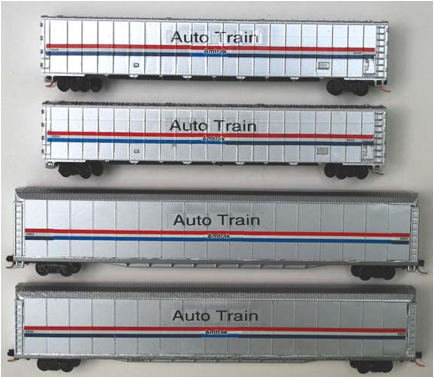 The newer 2-level auto carriers appear similar to the older 89’ carriers, but they are painted in Amtrak’s phase VI scheme. Today (2012), 18 passenger cars and 33 auto carriers are often used. Consists varied seasonally according to demand. The consist I modeled is a typical 2000s train taken from the Wikipedia article. 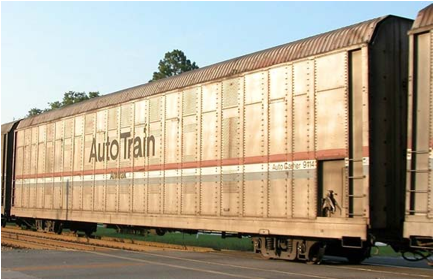 Before the mid 1990s, the auto train would have standard height passenger equipment plus the original full-length Santa Fe dome cars used on the original auto-train. 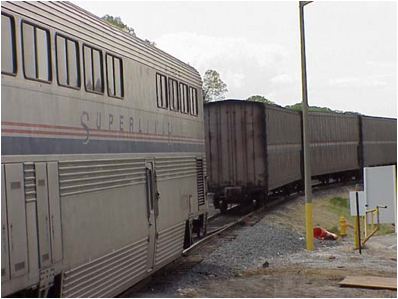 In 1995, the auto train upgraded the passenger cars from heritage cars to superliners. After the mid 2000s, the 75’ auto racks would be gone and phase IV and V paint would predominate. 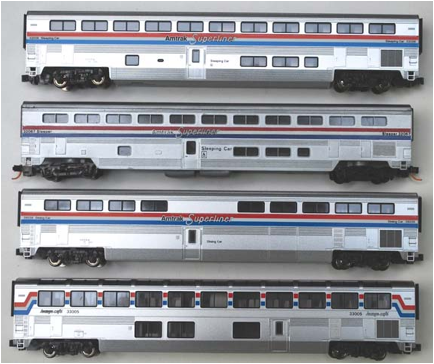 The passenger part of the train is easy to model because all superliner cars and locomotives are available factory painted from Kato. 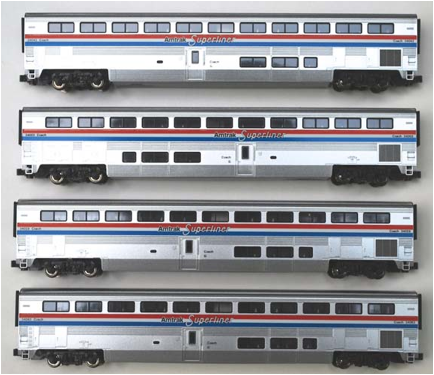 Superliner coaches, sleepers and lounges were also made by Con cor, but the Con cor diner model has a window where the window-less serving area belongs in the center, and is not a good model. The auto carriers must be custom painted, and there is no good prototypically accurate model of the 89’ carriers. I painted and decaled two 75’ carriers in Amtrak phase III paint, originally made by Bachmann for the original 1971 auto-train. 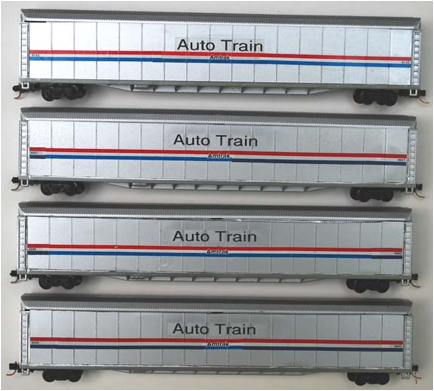 The prototype 89’ carriers have smooth side panels with fine ventilation holes, but the available factory-decorated models from Con cor and Micro-trains (now out of print) have variable-width and more three-dimensional side panels that are prototypical for freight railroads but not for the auto train. I applied some side panels of scored styrene sheets to the sides of Con cor auto racks after removing the individual panels and grinding the ribs down smooth. It is not a perfect model, but looks more prototypical than the commercial models. 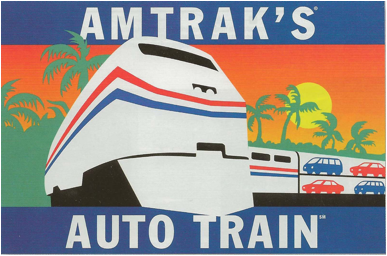 Auto train poster from the 1990s. 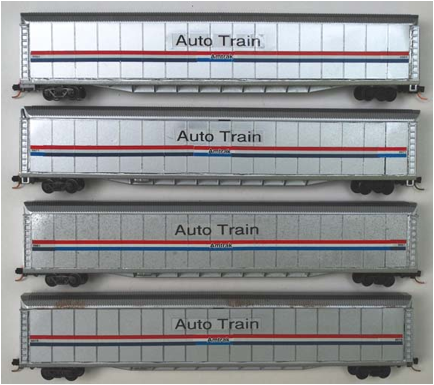 Note the 2-level auto carriers that are the same height as the superliner cars. From Amtrak, An American Story, page 73. 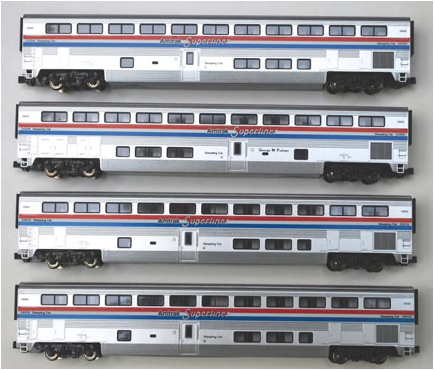 Three-level Amtrak auto carrier 9114 in phase III paint. This car was inherited from the auto-train corporation. Photo by Joe Pusey. The joining of the passenger and auto carrier sections of the autotrain at the Lorton terminal in 2000. The diner car was already in phase IV paint, but the 75’ autoracks have phase III stripes. Apparently this train is using a dining car as a coach lounge, which is the last car before the auto carrier section. The power is two or sometimes three genesis P42 diesel locomotives made by EMD, typical of most non-electrified Amtrak trains. Next is a “transition sleeper” used as crew-quarters. The prototype car is a 1954 hi-level step-down coach dorm (high-level door at one end and low-level at the locomotive end) originally used on Santa Fe’s El Capitan and bought by Amtrak and formerly run on the southwest chief. All are Kato models in factory phase III paint. Following the dorm car are six superliner sleepers. All are in phase III paint. The 5th sleeper in the model train is made by Con cor, the others are Kato models, and all are factory painted. Next are a dining car and a sightseer lounge, both for the first class passengers in the front of the train. Four coaches follow the first class section. All are factory decorated Kato models in the phase III scheme. After the coaches are the two diners and lounge car assigned to coach passengers. All are factory painted Kato models, the first diner is phase III and the second diner is phase II. 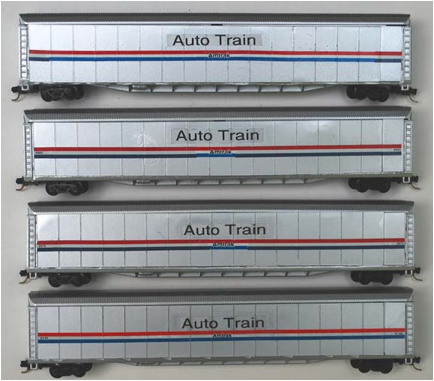 In the mid-1990s to mid-2000s, the auto train had both the 75’ two-level carriers (my model train has only two) and the 89’ 3-level carriers. The model 75’ carriers are custom painted and decaled Bachmann models. The 89’ carriers are modified Con cor models. I removed the perforated side panels, ground the ribs flat, and glued a styrene sheet that is scored to simulate individual panels. There are 18 long carriers in this model train. There could be a few more auto carriers to make a prototypical train, but this gives a good impression. The Amtrak decals are from microscale, and the “Auto train” labels were made with a Brother brand printing labeller on clear tape with black letters. I have not found lower case decal lettering, and the labeller can make two fonts of letters in 6 sizes. The label tape is self-adhesive, but unfortunately not as thin as a decal. Amtrak By the numbers: a comprehensive passenger car and motive power roster -1971-2011, Simon, Elbert and David Warner, White river productions, 2011, 256 pages. This is an excellent book with hundreds of car, locomotive and train photos.